In our business, quality is measured in terms of hotel service and convenience of transport towards London's sights. Adding to this highly affordable room rates, a hotel is adding value to its customer's money. The recently refurbished 70-bedroom Pembury Hotel based in London's Finsbury Park provides its customers with all the above mentioned benefits. Its well known service and low prices combined with its location (2 minutes walk from Finsbury Park Underground Station which connects directly to all major Central London's Underground Stations and also directly to Heathrow Airport) are terms of quality that established Pembury Hotel in a favorable position and are the reasons why the hotel is chosen repeatedly by business and other customers both local and throughtout Europe. All rooms offer Tea & Coffee Making Facilities, TV with Remote Control, Hairdryer and Continental breakfast included. Children upto and including the age of 2 stay free. Bookings must be cancelled 3 days in advance of your arrival date. In the event of a no show or a cancellation with less than 3 day notice prior to the date of arrival, an amount equivalent to one nights average cost of accomodation will be charged. Please note that payment is to be made upon arrival to the hotel. Also, customers have the option to request a non-smoking room. 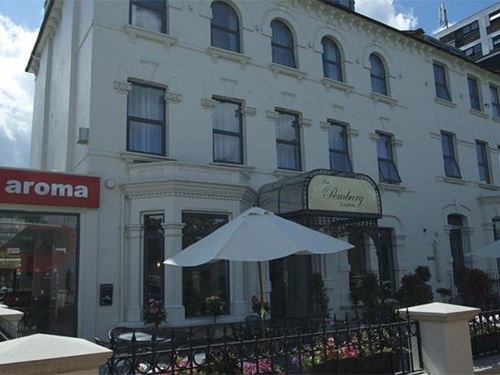 The Pembury Hotel is situated very close to Finsbury Park underground station, enabling direct access to Central London. All major London's sights are easily accessible. Heathrow airport is 30 minutes away using the underground. Single en-suite room; if you would like to use the iron or ironing board please see reception. There is a breakfast restaurant and a comfortable lounge area. 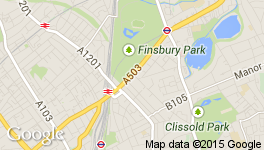 Located in Northal - Central London, in Finsbury Park. The hotel is situated in front of a beautiful park and on the main road of the area that links to Cental London. Moreover, it is 2 minutes walk from Finsbury Park Underground station that links directly to the centre of the town and to Heathrow airport.